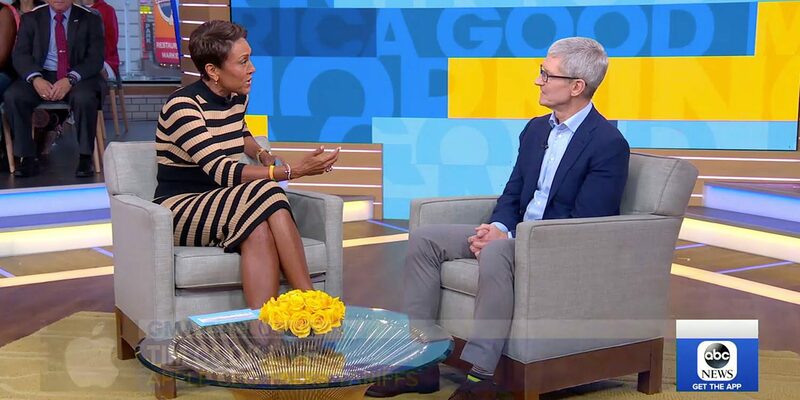 We heard yesterday that Apple CEO Tim Cook would appear Good morning Americaand suspected that the trade war with China would be one of the subjects. The show indeed began with the question to Cook why Apple products were excluded from the tariffs. The iPhone is assembled in China, but the parts come from everywhere, including the United States. The glass comes from Kentucky, there are chips coming from the US, and of course the research and development is all done in the United States. Cook said he remained optimistic about how things would go, despite the current chaos. I am optimistic because trading is one of those things where it is not a zero-sum game. You and I can exchange something and we can both win. So I am optimistic that the two countries will arrange this and life will continue. Asked about the responsibility Cook felt when running a multi-billion dollar business, the CEO responded by pointing out what he saw as Apple's contribution to the US. From my point of view, Apple could only be made in America. We are a deep American company. So we feel tremendous responsibility to help our country. We do that in the field of job creation, we have created two million jobs in America and we want to create more. We invest $ 350B in the country over the next five years. Cook also spoke about the Everyone Can Code initiative as an important contribution of the country. Asked to justify the costs of the new iPhones, Cook started with a somewhat dubious claim, but was about value rather than costs. We want to make an iPhone for everyone. That has always been our goal, and we have several iPhones in line that are going down to be significantly lower [prices]. But if you look at this phone, it […] has an incredible camera and has the smallest and most powerful chip ever in a smartphone. Cook said that most people pay a monthly fee through a provider, most iPhone owners pay about $ 30 a month for it – or a dollar a day. That is a good price for what you get, he argued. Your phone has replaced your digital camera [and] your video camera. It has replaced your music player. It has replaced your video player. It has replaced all these different devices. The product is really very important and we have noticed that people want the most innovative product – and that is not cheap. Cook explained why Apple added the ECG functionality to the. It is the most powerful thing you can have on your wrist. We have received many notes from our customers over the years that they discovered that they had a heart problem and that they would warn them that their heart rate was increased despite not being trained at the moment. They sought medical treatment and the doctor told them that if they had not sought help, they would not be here. So we started to research more and more, what else can we do for heart problems. You can take the full interview at Good morning America.